The French women’s team arrived in Los Angeles yesterday to prepare for their three-test tour of United States. The squad arriving in the USA is almost unchanged from that announced just over a week ago, with seven players involved in the climax of the Top 10 club Championship joining the rest of the squad, who have been training for the past week, just in time for the flight. The French Sevens coaches had first pick of available players, and so the squad is missing several big name backs from the last Six Nations squad, including Caroline Ladagnous, Julie Billes, Marjorie Mayans, Jade Le Pesq and Elodie Guiglion. However, up front, indeed from at least 1 to 10, this is the first choice side, and will almost certainly form the core of the squad to challenge for the Six Nations and World Cup next year. There are two new caps in the squad. Lille’s Yanna Rivoalen is a 23 year-old PE teacher and scrum-half from St Juste en Chaussee and has been at the centre of her club’s astonishing rise through the ranks of French club rugby in recent years. Switching from tennis to rugby in her late teens, within a year of taking up the game she was part of Lille’s 2009 national sevens championship winning team. In great form in the Top 10 this year, her try nearly turned the final Lille’s way last weekend. When current French captain and scrum-half, Marie Alice Yahe, retires after the World Cup, Yanna will be competing with Montpellier’s Jennifer Troncy for the national number nine shirt and, with Jennifer preparing for Moscow, this will be a great chance for Yanna to make her claim. 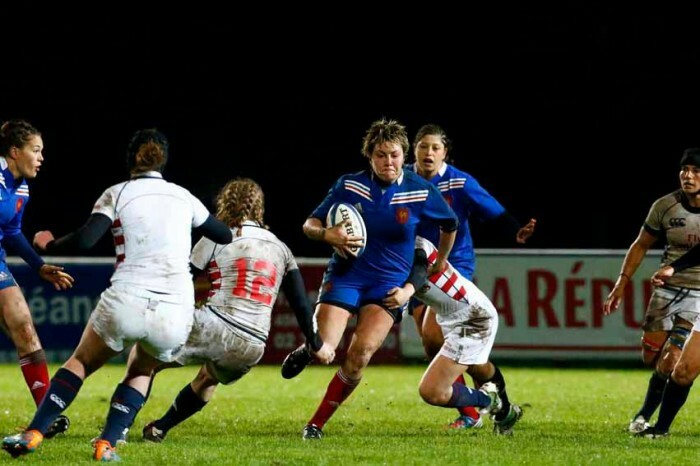 In addition a last-minute change sees the inclusion of former U20 No 8 Sophie Pin, who was part of the French junior squad that devastated England in 2012, and has had an important role in winning promotion for her club, La Valette. Sophie is also captain of the Marine Nationale (French Navy) Women’s XV, and joins fellow “matelot” Sandra Rabier in the team. Sophie replaces Marine De Nadai, who withdrew with a injury picked up at the weekend. Five players in the squad are from new national champions Montpellier, including fly-half Aurelie Bailon, who has been in immaculate form since returning from injury during the Six Nations. Her faultless performance with the boot on Saturday won the championship for her club, and if she can bring this form with her to California it will be hard to see beyond a series win for the French. There are some curiosities in the squad, in particular the selection of three full backs (Parra, Esteve and Tremouliere) which points to a desire by the coaching staff to continue to develop the latter of the three into a ten and back-up for Bailon (whose Achilles heel is her injury record). It is a task that did not go smoothly in the pressure-cooker atmosphere of the Six Nations this year, but which might be more fruitful in the more relaxed conditions of a tour. The team will be staying on the campus of Cal Lutheran University in Thousand Oaks, northwest of Los Angeles, and Les Bleus will play their first two games Friday (or early Saturday morning European time) and next Tuesday at Oxnard College a short distance from the beaches of Malibu. The third match will be held on the 14th at the Home Depot Center in Los Angeles, as a curtain raiser men's USA-Tonga match. The French selection: Agricole (Rennes), André (Saint-Orens), Arricastre (Lons), Bailon (Montpellier), Chobet (Lons), Corson (Rennes), Diallo (Bobigny), Esteve (Lille MRCV), Ezanno (Rennes), Fourcade (Bordeaux), Godiveau (Rennes), Grand (Lons), Héguy (Bayonne), Koïta (Bordeaux), Métier (Bobigny), Mignot (Montpellier), N'Diaye (Montpellier), Parra (Montpellier), Pin (La Valette), Portaries (Montpellier), Rabier (Caen), Rivoalen (Lille), Rousseau (Perpignan), Sainlo (Bobigny), Trémoulière (Romagnat), Yahé (Perpignan).